Most of us would love to have our landscaping ideas be photo-worthy to some photographer, but unfortunately that is not always the case. What exactly makes one landscape draw the eye over another? It's a tough task to take an empty yard and turn it into a true work of art. Some gardeners actually go to college and take specialized training to learn how to do landscaping on a professional level, so it's not really surprising that the average person finds it a little difficult. What we are going to do in this article is highlight some key points in home landscaping photos, and eventually we will get some stock photos on this page so that you the reader can have a visual aid to hopefully give you some ideas or inspiration. Landscaping requires a lot more planning than just buying a few plants at the local garden center and plopping them down in the yard. So let's get started! Now I'm certain more than one of you reading that first paragraph header raised an eyebrow and thought, driveways? 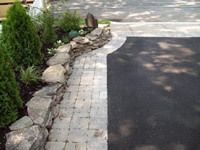 Driveways are often one part of a landscaping project that gets neglected and I always found that odd because in many home designs, the driveway is the first part one sees when they approach the home. It only stands to reason that you should highlight this first entrance in a way that would set the tone for the visitor. 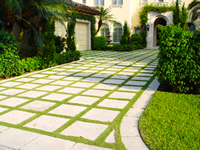 Here are a few ideas from home landscaping photos that you can use to spruce up your driveway. One common way of accenting a driveway is through the use of walls and gates. While this option tends to get a little pricey and is often out of reach of the average homeowner, the results can be simply stunning. If gates aren't your thing then consider a small wall that runs parallel to the driveway on either side. You could add small parapets at measured distances to hold planters or exterior lighting, if your driveway is in an unusually dark area. If this is still out of your price range, consider spacing out perennials along both sides with small beds of annuals mixed in between. This will give you great eye catching color, along with the lasting beauty of the perennials. 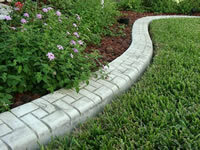 Borders can take on many different roles in home landscaping photos. Some are designed for privacy, like fences and walls, others are used to simply define the boundaries of one's property, while others still are meant for beauty and are built along the property line just to keep them out of the useable part of the yard that we have to maintain week to week. For instance not every neighbor would be happy with you driving your mower on his or her property just to mow a sliver of grass behind your flower bed. Borders give your landscaping a sense of definition and a more finished look. If you question the value of defined spaces, take a drive around your local neighborhood and see which yards are the first to grab your attention. I'm betting you will find that the one with fences and other landscaped borders will be among the first. The yards that just blend grass from one property to another are usually the ones to get lost in the visual. 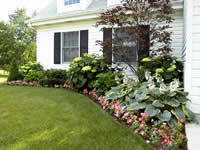 Without definition, yards tend to bleed together and it's tough to tell one property from another. Since trees, hedges, and shrubs are often the subject of home landscaping photos, this is a good time to give them a mention. Many people don't like the hard look of fences and prefer a more natural appearance, yet they still want to define a given space in their landscaping. Living borders are usually the way to go in these cases because they are so adaptable to a wide range of landscaping ideas. 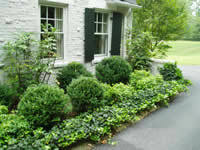 Not only that but you can also choose shrubs and hedges that produce various colors for different effects. You will frequently see these in home landscaping photos. Forsythia bushes are a perfect example of a bush that makes a great border to welcome in the springtime with their bright and vibrant yellows. You can plant several of them in a row and let them grow big and tall and wild, or you can keep them trimmed and shaped for a more contemporary look. If you would rather see color in the fall, look into placing burning bushes along the edge of your property and when the leaves turn red in October you will not be disappointed. There are plenty of other great options you can pick from to either block a particular border, or just to accent it. It wasn’t too many years ago that homes were built with foundations that stuck out high above the ground level, and as a result many homeowners planted foundation gardens around their home to hide the unsightly construction work. Nowadays this is not as big of a deal as it once was, but the tradition of planting gardens around a home is still an intuitive fit. Think of it as a transition from something manmade to something nature made. The perimeter of a house is a natural fit for gardens because you only need to access it from a single side. If you are designing a front garden, consider the approach to your home and what you want visitors to see when they arrive. Typically these gardens are designed to accent the front door where most people go first. The backyard gardens are usually built as a retreat, a place where one can go to relax and get away from the hustle and bustle of everyday life. Gardens built around the sides of a home will typically include pathways leading from front to back. Think of these as transitional gardens as well, leading one from one scene to another.